Before seeing a film, I always do my best to not let the critics and numbers sway my opinion so that I can conduct a proper and unbiased assessment. After the film ends and I have determined what my consensus will be, I allow myself to check the scores on Rotten Tomatoes, IMDb, and Metacritic; if I am more of an outlier than I expect, I always fear that I’ll let peer pressure get the best of me. I have grown as a critic and am confident in my ability to accurately and frankly judge a film based off my personal thoughts, and with that; Valerian and the City of a Thousand Planets is a dazzling and gorgeous movie whose visuals cannot protect it from some of the worst plot-structure, character development, and dialogue I have ever seen in such an costly blockbuster. The film’s logline from IMDb is as follows, “A dark force threatens Alpha, a vast metropolis and home to species from a thousand planets. Special operatives Valerian and Laureline must race to identify the marauding menace and safeguard not just Alpha, but the future of the universe.” The film stars Dane DeHaan (the best part of Chronicle) and Cara Delevingne (the worst part of Suicide Squad, which is saying something). The film consists of some great actors, as well as Rihanna and Delevingne. I’ve seen DeHaan and Clive Owen give stellar performances; so I’m not sure if it was Luc Besson’s direction or their complete disdain for the script that had them fall far flat. It’s never a good sign if the best acting in your film is a three-minute cameo from Ethan Hawke. Luc Besson’s claim to fame, Léon: The Professional, was a film that lacked the world-building of some of his other projects but had memorable characters and an impassioned story. His next noteworthy film, The Fifth Element, may have lacked the narrative devices that made Léon such an achievement, but it made up for it in creativity with its universe in a way that was never before seen in such fashion prior to its release in 1997. Since the release of Avatar in 2009, just having a striking and original setting isn’t enough to astonish audiences; like the record breaking bomb John Carter learned, you also need to spend a little time on the script. To say that DeHaan and Delevingne had no chemistry is an understatement; they had chemistry, it was just awful. Not in recent memory do I recall feeling as uncomfortable with a pair of actor’s patter than I did with Valerian and Laureline. Within the first two minutes of the character’s introduction, before we have any idea as to their relationship or past, we see Valerian awkwardly and gawkily ask for Laureline’s hand in marriage. The scenes after unfolded with utter gracelessness and only add a cheap love subplot to an already blundering narrative. Clumsy isn’t the correct word to talk about the film’s script, clumsy alludes to their being effort exercised; careless would be more accurate. Quips and one liners galore, none of them were able to hit, “Time flies when you’re having fun.” The big reveal towards the end of the film regarding the inciting incident feels extremely uninspired and something that was just an end to a mean to be able to finish the picture. A great ending can save a bad film, but a bad ending can destroy a bad film. Now those two whole stars down there did come from somewhere. There are a few incredible scenes in the film that were unquestionably pleasurable to watch. Valerian running through the city, continually crashing through barriers and going from one alien community to the next was a fresh break from the dullness. 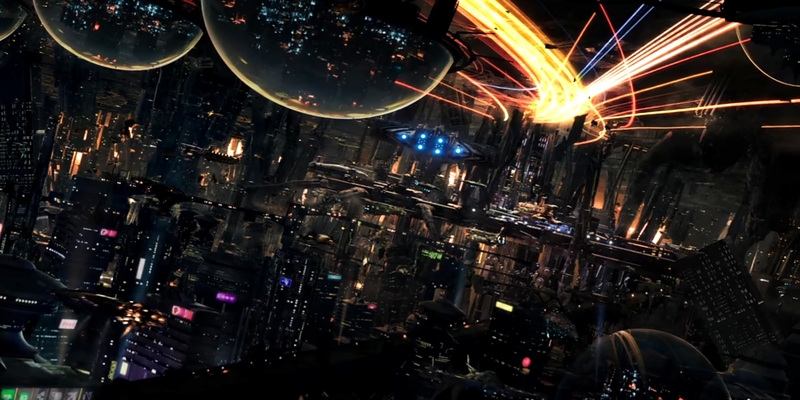 The idea of the city, Alpha, is an interesting concept that comes to fruition during the film’s opening where it’s origin is divulged and its history recounted. But 15 minutes of tolerable footage in a film whose runtime is 139 minutes is not satisfactory. I’m aware I am partially in the minority with my disdain for the film, both critics and audiences have given the movie acceptable words. Though the antonym of that consensus is exactly what I feel the movie is: unacceptable. €197 million is an enormous amount of money to spend on a film and to allow the narrative, arguably the nervous-system of a film, to be so lacking is truly unfortunate. I rarely am sinister concerning a film (save the Fantastic Four reboot, which I celebrated its dismal box office returns) but I truly hope this film is a bomb and studios and filmmakers will learn the lesson many thought the contempt for Suicide Squad had taught; your characters, the way they act, the way they talk, the things they do, and the things that are done to them aren’t a part of the movie, they are the movie. I whole-heartedly agree. Sick of visual diarrhea trying to cover a lack of a truly involving story with compelling characters we care about. Sad too, so well directed. An unfortunate swing and a miss!